KUALA LUMPUR: Laksa, nasi lemak and bak kut teh — these are some of the food Malaysia will lay claim to. Tourism Minister Datuk Seri Dr Ng Yen Yen said there were many dishes synonymous with Malaysia’s identity but they had been “hijacked” by other countries. “We cannot continue to let other countries hijack our food. Chilli crab is Malaysian. Hainanese chicken rice is Malaysian. We have to lay claim to our food,” she told reporters after launching the Malaysia International Gourmet Festival yesterday. 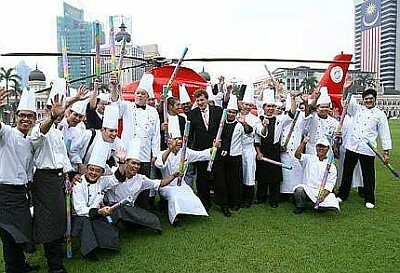 The festival, which runs throughout October, is part of the Fabulous Food 1Malaysia campaign. Novem-ber’s part of the campaign will centre around shopping mall food, while street and heritage food will be the highlight in December. “In the three months, we will identify certain key dishes (to declare as Malaysian). We have identified laksa ... all types of laksa, nasi lemak and bak kut teh,” she said. When asked how the ministry would go about labelling the dishes Malaysian after identifying them, Dr Ng said she would reveal her strategy at a later stage. “That is Part Two. We cannot reveal it yet, but we will let you know soon,” she said. On another matter, Dr Ng said tourist arrivals in August increased by 10.4% to 2,030,337 compared to the corresponding period last year. For the first eight months of the year, arrivals went up by 4.4% to 14,730,437 compared to the corresponding period last year. Dr Ng said arrivals from China increased by 14.8% in August, while arrivals from Australia and Britain increased by 26.6% and 16.5% respectively. Double-digit growth was also recorded for arrivals of tourists from more than 20 countries, including Poland (59.9%), Italy (49.7%) and Iran (40.4%). To further boost tourism, Dr Ng said 500 guides were undergoing a three-month foreign language course. “They are being trained in Russian, Arabic, South Korean, Japanese and French. It is a scholarship. Right now, we only have two Russian-speaking guides. That is not enough,” she said.